I remember baking this colorful bread around Easter time for our young children and then later for our grandchildren. At the time I didn't have these vibrant food colors and so the bread was more pastel in color. This is a fun bread to put together and a good project to do with your children. Can you imagine their smiles when eating a slice of this bread? Whisk together warm water, yeast, sugar, and oil. Stir in flour and salt to the liquid mixture, knead until well combined, approximately 5 minutes. Separate dough into balls, as many as the colors you have chosen. I had 6 colors: red, orange, yellow, green, blue, and purple. 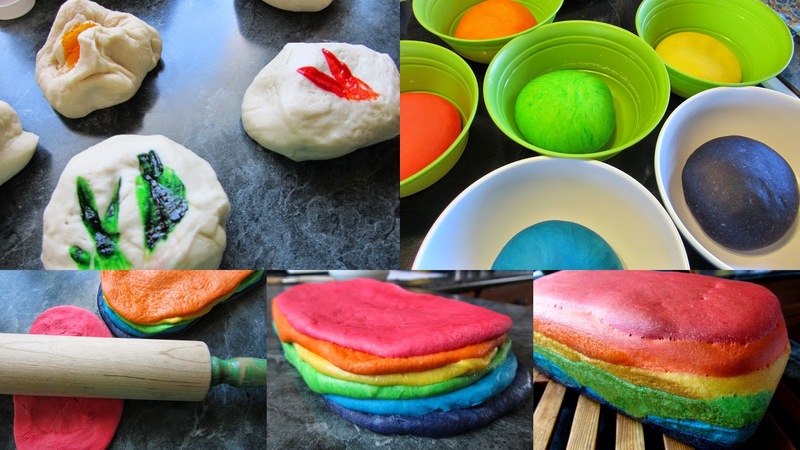 Add each of the colors to each of the balls of dough for desired color. It takes awhile to evenly knead in each color, be patient, it does come together. Be sure to wash your hands and the surface you are working on between each color. Place each ball of dough into it's own bowl, cover and allow to rise until doubled. Once doubled, take each ball and roll out in a rectangle to fit a 9" x 5" loaf pan. Stack them and place in a well greased loaf pan. Cover and allow to rise until almost double in bulk. Bake in a 350º oven for 30 minutes. Remove bread from pan to cool on cooling rack. Slice, slather on your favorite spread and enjoy. Wonderful, this is so joyous, perfect for Easter. What a fun and delightful treat. A beautiful loaf of bread !! Wow Betty! My grands would love this. How does the bread taste with that much food colouring added? In my experience, when adding that much colouring to icing, it tasted very bitter. The bread tastes just like regular white bread. I used gel food colors and you don't need very much to get these bold colors. This would look awesome when done like the Lemon layered loaf! Next time my little granddaughters visit we are going to make this, thanks! That looks like fun. Easter here we come! I'd like to make this with my Grandson. He would love it!